It’s spring in the desert. Farmers are tilling and planting the fields, here. My garden plans are in the works. So far, I’ve only managed to turn & plant 1/4th of the big garden, and move some of the volunteer onions & camomile. The thyme has sprouted in the herb garden, but, the fava beans & peanuts haven’t yet. IDK if the peanuts will, I collected them from a bag of bird seed. My goal was to use them as pretty flowers and soil enhancements. It’d be interesting if any do grow. I pulled the the last of the carrots and need to harvest the beet greens, before I can finish turning the soil in the big garden. Another experiment I am trying, is allowing last years tomatoe plants to grow, after trimming them back. One of the branches rooted itself. When I was cutting the frost damage off, I cut the main stem to that branch and it seems to be growing much better. So, I will have 2 plants from one original seed. Lol. Of all the avacado seeds I’ve planted, one has sprouted this year. The 2 year old tree, in the lick tank is producing new leaves. Another seed is swelling and potentially it might sprout. The big test will happen when it gets hot, around here, whether they will survive. So many 1 year old avocado trees have died, once the temps rose above 105*. Trial & error, I keep trying. We won't be planting any garden this year. Our plans are to transplant our blackberry and raspberry bushes, take down both of the mulberry trees and probably take out the raised beds. We're planning to go pretty much only container gardening when we resume. The only beds we'll plant will be Okra and pole beans...when we re-build raised beds. We're stocked up on several of the large "mineral-type" containers that farmers use for livestock. We have a friend who runs cattle so we'll see if they've got a few more for us to add to our stock. We'll buy Mennonite/Amish this year and I'll put those foods back for the pantry. We have two produce auctions in our state and after the "big buyers" are though, they have another sale for people who want the smaller quantities. Sometimes you can even buy just a few from one of the big buyers. We've got "a lot" of seeds set back, so it just makes sense to us to buy fresh grown produce and then plant at a later date. We want to do some travelling this year. Our spring garden is moving right along. Our friend Deb came & stayed a couple days to help "chainsaw Mary" take down a hollow tree too close to the house for comfort Im no help in my neck brace and under strict orders not to bend over (to avoid hyperextention of the neck) or lift anything heavier than a gallon of milk. So I stayed inside & cooked, while they took down the tree which our artist friend has all kinds of plans for. Then they went to work in the garden - put up a third raised bed and filled it with trucked-in dirt (our "natural" soil is red clay, not terribly useful unless you're a potter). Moved the fence a bit and put everything in a single enclosure - 3 raised veggie beds and a strawberry pyramid bed. We bought some transplants from our local garden center (much better than wal mart) along with 4 camellia bushes. Mary & I have wanted camellias ever since we saw them blooming in December on one of our pre-move visits. I made out the diagram of vegetable garden layouts (she likes a diagram) and have also decided on the herb garden location (yet to be created). We also have most of our seeds on hand for planting, each in its own season....yes, even those turnip greens which ironically were the hardest to find seeds for. We will be planting our early spring garden the next few weeks, and rotating in the late-spring-summer garden as the weather evolves. Deb took home a grocery bag of lettuce greens (romaine and a curly-leafed ruffly variety) and a couple of our winter cabbages to her husband - he revamped his diet radically and is a real veggie-lover. We have a running joke now about how we pay our helpers in firewood and garden produce. Country barter at its best. The redbuds are in bloom, along with the potentilla and blue-eyed grass that grows in our (so called) lawn. The spring veggies are IN and we are seeing our first radish sprouts! It is thrilling after all those years in zone 4 to be able to grow year-round! Our third raised bed is near enough to the other that a simple re-arrangement of the posts allowed all to be fenced in the same enclosure with room to walk. Then off to Tractor Supply for deer corn...and (uh-oh) two metal raised beds (on sale, cheaper than the lumber would have been) one for our raspberry patch (the first one died, or got eaten, or just plain disappeared). The other will be a bulb bed in the front yard to supplement our vertical "shed garden". Yes we are putting it back up again, the neighbors were very complementary about it last year and are already asking if we will do it again. Then bought two peach trees (darn those sales! they get me every time!) to replace the one that died. I had to order another 3 tier round bed for more strawberries. Then to see what transplants our local nursery of choice had - bought 4 camillias. Sheesh. We might have the veggies in, but are still digging in fruits. The "old home" place is shaping up nicely! Today we took a day off from digging in the clay and put the boat in. Had a nice ride out on the lake to break it in. Very relaxing! I’m so impressed with the progress you are making, and enjoy hearing about your year round garden, Kappydell. 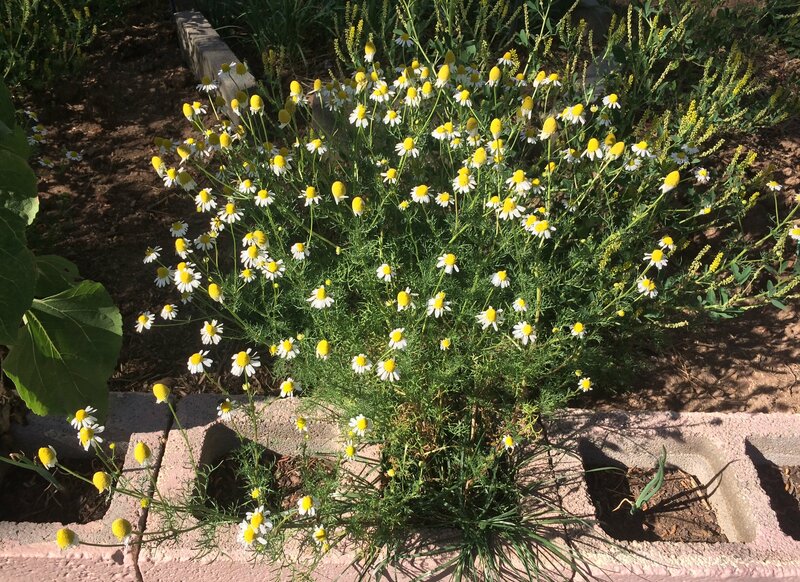 The volunteer camomile is flowering all over, very pretty in the herb garden, (Thank you Christy!) I transplanted several plants that I found growing in the lawn. The Greek oregano is about 2 foot tall and the peppermint is starting to grow. This year, I am putting an one foot mulched pathway covered with cardboard, between the 3 foot sections. However, Grrr keeps digging it and eating the compost/mulch. Brat. I’ve had to scrape it all back together a few times. Trimmed the tomato & jalapeño plants in the front flower bed. DH wants me to plant more tomatoes. Still have an 8’x8’ section in the big garden & a 6’x6’ triangle section to turn & plant. Even though we're not actively "gardening" this year, we will be putting together our containers for garden next year. We'll be using this method...of self-watering containers. Check with any farmer/rancher that has livestock...most of them buy their minerals in these tubs. Might just give you a few or sell very cheaply? We have several already but plan to check with a cattle rancher friend to see if they have any they'll turn loose of. That looks like something I'd be interested in for planting herbs. Planting herbs in the ground scares the stuffing out of me. I'm having a 30 year old battle with lemon balm that I'll never win. Just finished tilling another 8’x3’ section of the garden. 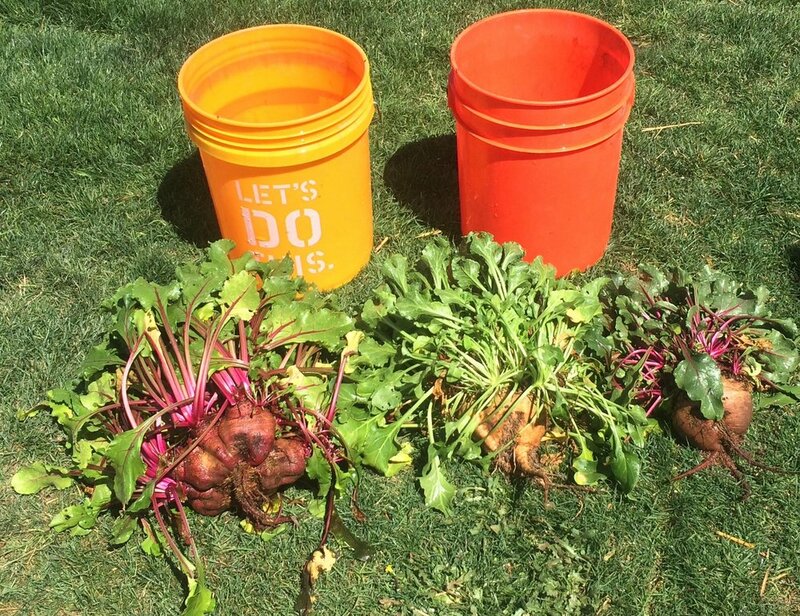 Pulled 3 two year old beets we’ve been eating greens from. Here’s the beet greens that will be processed later today. The garden; fava beans, lined with onions, then, radishes-which are just sprouting, and carrots, lined with more volunteer onions, and the plot I finished today. I haven’t decided what I’ll plant there yet. I’m going to collect the seeds from the remaining beets and there’s the tomato plant, that made two on the right side, behind the beets. The camomile is in full bloom & the yard is finally looking good. True Kappy. Every once in a while I'd get a whiff of lemon. I really want some for tea but it needs to be in a container. Same with regular mint. Wow Annarchy that is a beautiful sight. Love the pictures. You are really taming that desert! Gunny is standing by the small hawthorn, Aloe Vera in bloom behind it, & the pomegranate tree, just starting to bloom, behind the desert willow, that gives morning shade to the garden. We’ve been here over 30 years, this is the first year things are finally growing good. The hens were extremely grateful for the dozen of grubs they got as a treat this morning. Lol. They didn’t get any of the earth worms. Amazingly, I found one in about every 2 shovel loads. Planted Butternut squash & tomatillos. DH says it’s supposed to get into the 90’s. Here comes summer in the desert. I saw the pupper right away but didn't know if it was Gunny or Grrr. Hawthorn berries are supposed to be really good for high blood pressure. Love those pics! Tired tonight - went to see a cardiologist to see if anything needed to be done regarding an aneurism found via a CT. He said no, surgery not required. Will monitor it, come back in a year and we will see if it is growing or not. Since Im already on BP meds & cholesterol meds, nothing further needed. Cool. After we got home & ate our pizza, we went & got supplies to make those wicking pots - plus bought MORE pots, Mary liked them and wanted more. Since our soil is crappy as a growing medium pots will be our way of working around it. The only thing that was expensive was that perforated drainage pipe (6 inch) since I could only get it in a 100 foot length! I can make a heck of a lot of pots with that much! We will be looking for totes on sale in the future, as they will also make nice big wicking pots. So we bought the components today (pvc pipe, landscape cloth, drain pipe) and a jigsaw to cut same. Then we went back to tractor supply and got some more of the pots Mary liked, and some straw to mulch our attempts at a lawn. When we got home, we got to talking about flowers we wanted. She was delighted when I showed her the seeds I had saved from last year that were exactly what we had discussed putting in - 5 foot tall trumpet lily bulbs; Perennial wild flower mixture; Nicotania (she was unable to find it in the store) and Four O Clocks (can you tell we like nice aromatic flowers?? ), more peonies, and the like. The garden centers are getting very picked over and those things were certainly not around this year. I sure was glad I had saved them. I am waiting for a seed shipment from a place called the seed kingdom. It is a place in TX and the owner is retiring (that figures, I just found him). He was the only place carrying the Floridale and Floridade tomatoes that are high heat and humidity tolerant, as well as an amazing collection of various southern peas and other hot weather vegetable cultivars. He is offering his customers a 2 for one deal - send in an order of at least $45 and then they will match it with $45 (or however much was spent) with other seeds you choose. Needless to say I ordered more seeds of things I did not want to lose - $98 worth - and ordered the free ones as well. I hope to share them with the Seed Savers Exchange so his open pollinated cultivars do not disappear altogether. If anybody wants to try out some hot weather adapted seeds let me know and I will let you know what I have. Tomatoes, southern peas, mustard greens and the like. Very old fashioned stuff. Kappy it sounds like you all are rearing to go for this garden season! Looking forward to lots of pics of you putting your gear together, planting, growing and havesting! IDK how well self watering pots would do when it’s 115*. Most of the potted plants I’ve tried, don’t do well, at.all. Maybe 1/2 buried or in the shade? Maybe I will try it in the fall or next year. Began digging the last garden area. It’s going to take time. 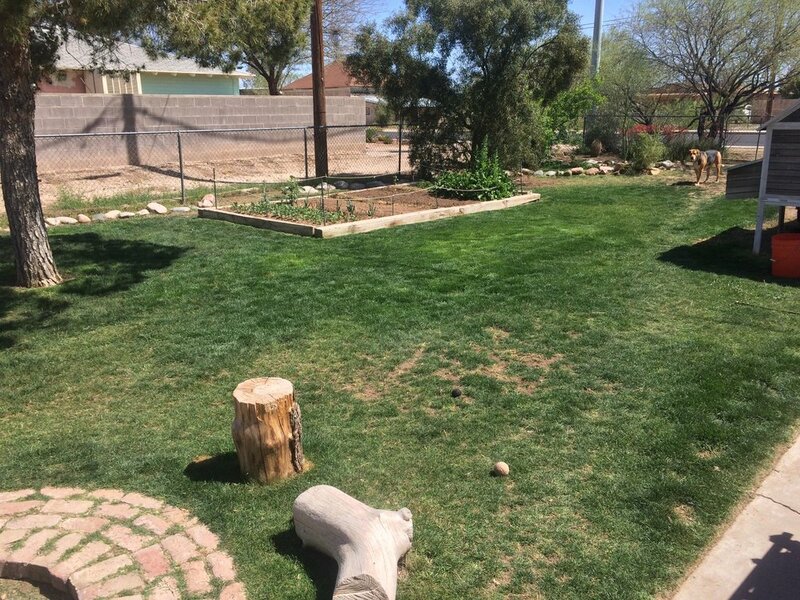 The soil is hard and there is a lot of Bermuda grass that needs to be removed. It also needs mulch/compost/straw. Hopefully I will be able to find a bale of straw soon. The store has been out for 2 months. I got the alfalfa, but, the hens don’t seem very impressed with it. Spoiled chickens. I cut up a plastic egg carton, separating the top and cut the bottom into thirds, giving me a 4 space planter, to start the tomato seeds, and the lid is now my mung been sprouting tray. I planted my flowers in my west side porch rail baskets and put out my shepherd's hooks on the east porch side, and got the baskets ready on them. Also my iron "umbrella" flower rack with it's pots. Me thinks me's not going to be able to resist putting "something" edible in a pot or two...maybe some 'maters, lettuce, radishes etc? The east side only gets morning sunlight (and the west side of the porch only gets the evening sun) so it shouldn't get too hot for lettuce and radishes. I can always pick up the pots and put them under the wrap around and covered front porch. Wanted the flowers ready for my bees. The Mason bee house is full of sealed tubes and other tubes apparently they didn't fill or they've already started hatching out, and they'll be within inches of my new flowers. The humming birds are due in shortly and I wanted flowers for them also. Dogs tore up the pathway, again, and walked through the radishes & carrot rows. Little Hooligans. No trip to the lake for them anytime soon. I know a couple of fuzzy butts who need a stern talking to. Good thing they are so darn cute! Mine used to dig up potatoes.